This year marks the centenary of the Russian Revolution and the Communist Workers' Organisation has participated in a number of meetings to commemorate this. On 18 November the CWO held a meeting in Newcastle to discuss its legacy, the revolutionary events of 1917-1918 as well as the process of degeneration. The following document – The Russian Revolution: From Workers’ Inspiration to Proletarian Tragedy – served as the basis of the presentation and was followed by a discussion. "On the evening of October 25th [November 7], when preparations were underway for the storming of the Winter Palace, the Bolsheviks assembled about 20,000 Red Guards, sailors and soldiers before that last refuge of the Provisional Government. But within the palace there were not more than 3000 defenders, and many of those left their posts during the night. Thanks to the Bolsheviks’ overwhelming superiority there were no serious battles in the capital … and the total number of those killed on both sides was no more than 15, with no more than 60 wounded." "During these critical hours, as all the main strategic points in the city passed under Bolshevik control (telephone and telegraph exchanges, bridges, railroad stations, the Winter Palace etc. ), Petrograd continued on the whole to go about its normal business. Most of the soldiers remained in the barracks, the plants and the factories continued to operate, and in the schools none of the classes were interrupted. There were no strikes or mass demonstrations such had accompanied the February Revolution. The movie theatres (called cinematographias in those days) were filled, there were regular performances in all the theatres, and people strolled as usual on the Nevsky Prospect. The ordinary non-political person would not even have noticed the historic events taking place; even on the streetcar lines, the main form of public transportation in 1917, service remained normal." When women decided to strike on International Women’s Day (March 8 in the modern calendar) the regime was taken by surprise and even revolutionaries in political organisations were caught off guard. However by the end of the first day in which no-one apparently died the women had brought out many other factories and on the second day the strikes and demonstrations spread. At first the commander of the Tsarist troops and police in Petrograd tried not to use ammunition against them because he did not want another “Bloody Sunday” as in 1905 (which would have overthrown the Tsar if only the troops then had not remained loyal to him). On the fourth day (which ironically was a Sunday) with the movement spreading the troops began to fire on the demonstrations. Crowds would scatter and reform down side streets and then march on only to meet more troops. Although some workers had hand guns they were relying on the troops to come over to them. In this too women workers played a major role in facing up to armed Cossacks and shaming them into lowering their weapons. By Monday some regiments had turned on their officers and this was the decisive factor in turning a strike wave of hundreds of thousands into a revolution. This was not going to be another 1905 defeat. In the demonstrations some workers began to call for the formation of soviets – they had not forgotten the organisation they had formed in 1905 to coordinate their strikes. But whilst they were still on the streets others in the corridors of power were already working out how to tame the movement. After much hesitation the parties represented in the Tsar’s fake Parliament the Duma, the Octobrists and Kadets (who really wanted to keep the monarchy) announced the formation of a Provisional Government. This was approved of by the so-called “moderate socialists” of the Mensheviks and Socialist Revolutionaries (or Essaires) but they knew that this Provisional Government selected by old Tsarist supporters would spark no confidence in the working class or the insurrectionary part of the armed forces. When soldiers advanced on the Duma they thus hastily announced the reformation of the Petrograd Soviet from 1905. But at this time the real revolutionaries amongst the working class were out on the streets with the workers and the Mensheviks had called for the first session to meet in the Tauride Palace at 7.00 that evening. Not surprisingly there were many more Mensheviks and soldiers’ representatives there. When the leading Bolshevik organiser in Petrograd Shlyapnikov arrived he thought that only 50 delegates were actually from factories. The Provisional Government hated all this and the Soviet Executive run by the Mensheviks and SRs tried to put a stop to strikes as “unpatriotic” now that Russia was a “democracy”. But the real “democracy” was to be found with the workers, the peasants in the fields and in uniform in the armed services. This democracy now faced up to “census society” (i.e. the privileged classes of the old order) in the Provisional Government. This democracy increasingly looked to the Bolsheviks, the Inter-district committee which stood between the Bolsheviks and the Mensheviks, the anarchists (although they were few in number) and the left wing of the SRs which in the course of 1917 was to split from the Right. “Census society”, that is the bourgeoisie, rallied behind the Kadets in the Provisional Government. What happens throughout the rest of 1917 is a roller coaster of a class war in which both sides strove for advantage. After Milyukov gave away the real war aims of the Provisional Government some Bolsheviks called for a demonstration against it and they only dropped it on the insistence of the Mensheviks in the Soviet Executive. 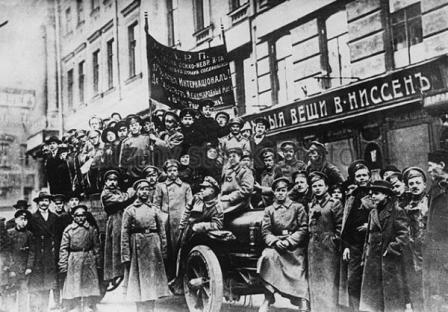 It looked like a climbdown by the Bolsheviks so to ram home their victory the Mensheviks organised a demonstration in support of the Provisional Government and the Soviet. It backfired spectacularly as Sukhanov (himself a Menshevik) tells us that banner after banner carried Bolshevik slogans with few supporting the Provisional Government. However in this seesaw struggle it was now the Bolsheviks who would suffer a dramatic setback. • The Second Soviet Congress overwhelmingly accepted the power presented to it by the Bolsheviks and the Executive Committee approved the setting up of a Council of Peoples’ Commissars (Sovnarkom) made up of Bolsheviks and Left SRs (although the latter did not take up their seats until December). All other parties walked out of the Soviet and refused to accept anything other than a return to a coalition with the bourgeoisie. • The new government announced Russia’s withdrawal from the war. It legalised peasant land seizures and workers’ control in the factories. Officials were paid only the average wage of a skilled industrial worker. • Nationalities of the old Russian empire were given the right to self-determination. • Peoples’ Courts were set up with elected officials to dispense justice and avoid mob lynchings. • Most of this took place in the first six months of the revolution. During this time the soviet principle was extended. 400 or so more soviets were established across Russia, the principle of immediate recall of delegates was established and Congresses of Soviets were taking place every three months. The first idea was to try to extort more food from the richer peasants who were assumed to be storing it (for speculative purposes) and requisitioning squads were sent out. They had no goods to exchange for the food and juts tried to leave notes promising to pay later. As money was becoming valueless they were fiercely resisted by armed peasants and a war within a war now took place.